Dubai, UAE, February 28, 2017: A great event and European Food Product Presentation and Lunch took place in Four Points by Sheraton Hotel in Kuwait on the morning of 16th of February 2017. Through a European program called “Great Flavors” campaign financed with the aid from the European Union and Greece, quality products certified by Protected Geographical indication (PGI) and Protected Designation of Origin (PDO) like gruyere cheese, pistachios, extra virgin olive oil, olives and currants, have the opportunity to demonstrate in Kuwaiti audience. The vice president of Agricultural Association from Naxos, the Greek biggest island of Cyclades, Mr. Iakovos Valeris, supplier of the special cheese Gruyere, represented the program and hosted many guests like importers, distributors, Journalists and cheese buyers to join them for a product presentation and Lunch in Four Points Sheraton Hotel. Attendees, watched presentation of the company, tasted Gruyere and discussed with mr. Valleris the import perspective product in Kuwait. Guests also enjoyed executive chef of Sheraton preparing a special recipe incorporating Gruyere EAS Naxos. 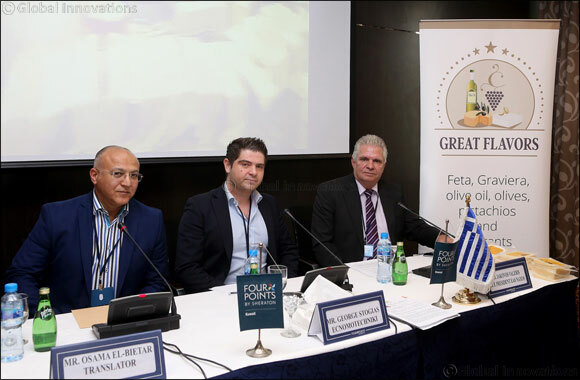 The event was also attended by the Greek Ambassador in Kuwait, Mr. Andreas Papadakis. The Naxos Gruyere P.O.D. is a hard cheese, with a golden yellow colour, and small scattered holes inside its solid and elastic mass. It has a thin and dry rind, a light and fine flavour, and a very pleasant, fine, and sweet taste that makes it ideal for any purpose.